People say we are living in surreal times, often citing politics and climate change as two examples among many. Looking for ways to cope? Try engaging with the art form of surrealism itself, as it is surprisingly clarifying. Beginning in the early 20th century, the proponents of Surrealism embraced the contradictions of reality, rejecting rational thought in favor of the revelations of the unconscious mind. Though perhaps best known as a visual art movement (fur-lined teacup, anyone? ), surrealism is a far-reaching aesthetic, enlivening fashion, theater, movies, literature, and so on. Even the arriving season of spring, with its dreamlike transformations, might be deemed surreal…have we taken it too far? Decide for yourself by reading some surrealist fiction from our collection. Though it shares traits with fantasy and magical realism, it is decidedly its own beast—think shocking juxtapositions, absurdity, and automatic writing—all in the service of a waking dream. Come check out our display of books that engage the surrealist aesthetic in some form—from examples of its earliest stirrings, to Afrosurrealism, to myriad contemporary iterations—all in Center for the Reader, and more on this list. Henry Dumas’s fiction is a masterful synthesis of myth and religion, culture and nature, mask and identity. From the Deep South to the simmering streets of Harlem, his characters embark on surreal and mythic quests armed only with wit, words, and wisdom. Championed by Toni Morrison, Walter Mosley, and Quincy Troupe, Dumas’s books have long been out of print. All of his short fiction is collected here, for the first time, and includes several previously unpublished stories. 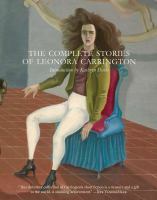 Writer and surrealist painter Leonora Carrington (1917-2011) was a master of the macabre, of gorgeous tableaux, biting satire, roguish comedy, and brilliant, effortless flights of the imagination. Nowhere are these qualities more ingeniously brought together than in the works of short fiction she wrote throughout her life. Paris Peasant (1926) is one of the central works of Surrealism. Unconventional in form —Aragon consciously avoided recognizable narration or character development—Paris Peasant is, in the author's words, “a mythology of the modern.” The book uses the city of Paris as a stage, or framework, and Aragon interweaves his text with images of related ephemera: cafe menus, maps, inscriptions on monuments, and newspaper clippings. A Parisian arcade and Buttes-Chaumont Park are among the great set pieces within Aragon's swirling prose of philosophy, dream, and satire. 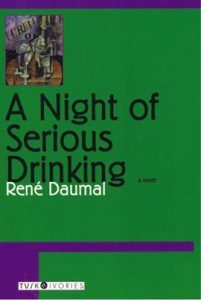 An unnamed narrator spends an evening getting drunk with a group of friends; as the party becomes intoxicated and exuberant, the narrator embarks on a journey that ranges from seeming paradises to the depths of pure hell. The fantastic world depicted here is actually the ordinary world turned upside down. The characters are called the Anthographers, Fabricators of Useless Objects, Scienters, Nibblists, Clarificators, and other absurd titles. These characters perform hilarious antics and intellectual games, which they see as serious attempts to find meaning and freedom.